Fred Bassett’s debut novel is the story of young Barsh Roberts, who navigates the rites of passage through adolescence in a small Alabama community during the late 1940s. Bassett writes in the tradition of Ferroll Sams, whose semi-autobiographical Porter Osburne Jr. comes of age in rural Georgia in an earlier time. To me, Barsh is especially evocative of Porter in The Whisper of the River, an enduring classic of Southern literature. I enjoyed this book for several reasons. 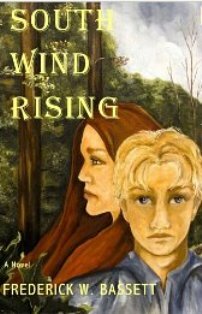 South Wind Rising is a compelling story of a young man’s formative years, a time of friendship and betrayal, sweet lips and fickle hearts, joy and heartache, where hormones rage, emotions run high, and things are never what they seem. But it’s more than that. The story has a kind of unforced authenticity that many self-described Southern writers are not able to achieve. In the small rural communities in Alabama after World War II and before the civil rights movement, a way of life emerged and in less than a generation it vanished, almost without a trace. Bassett’s astute social observations and finely drawn characters bring it all back. Maybe that’s what impressed me the most. I grew up in such a community a few years later than Barsh and many things were the same—the faithful at the Holiness church were dismayed at the sight of teenaged girls wearing short shorts, folks of modest means on the edge of town kept a milk cow, an older guy with a Harley had designs on my girlfriend, and the road to broken dreams ran through Panama City. On the other hand, girls his age jitterbugged to “Move it on Over” by Hank Williams because it would be several years before Joe Turner hit it big with “Shake, Rattle and Roll,” and their younger sisters were doing the bop. And first dates were at the picture show. As I recall, we first began to say “movie” during Ike’s first term as president. Bassett gets these things right. Jim Buford, Alabama Writers’ Forum Board Member and writer, is a management consultant and adjunct professor at Auburn University.